Non Standard Thatching. The faster, cheaper and easier ways to thatch a roof. 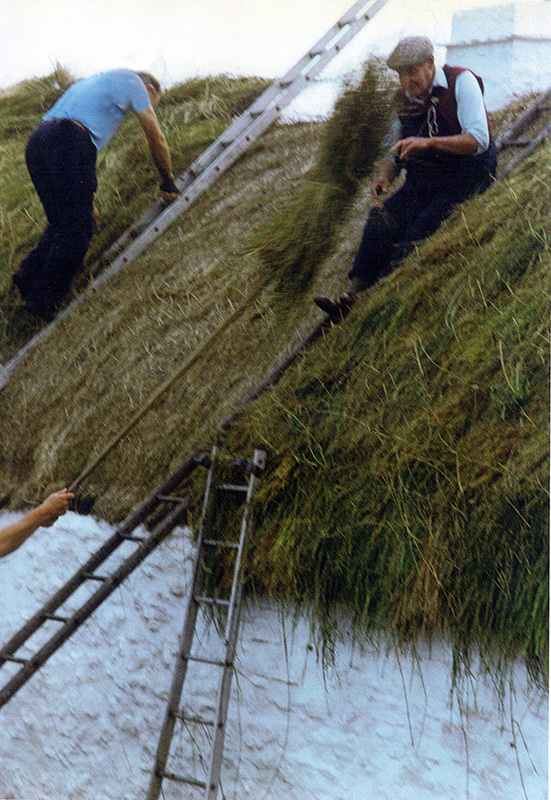 All this work was carried out using a non standard method of thatching… The Directional method. In other guises this is still widely used. But firstly let’s look at some non standard working methods, that have not stood the test of time quite so well. Stobbing and Clay Roofs… Who needs spars? 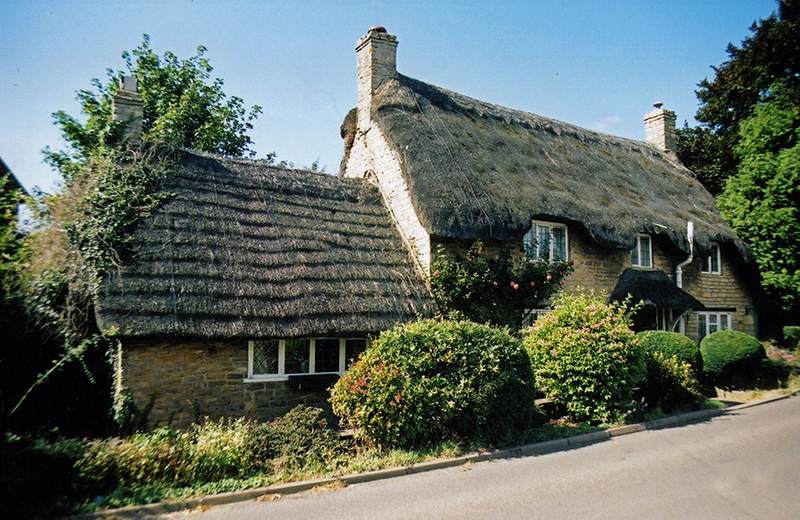 The Stobbing, Stinging or Tippeting method of thatching is probably quite unknown to very many modern thatchers… Yet, less than a century ago, this type of thatching was widely practised, over much of Britain. From Inverness to Derbyshire and from Leicester to Cardigan Bay; with more than a few thatchers in this huge area, using no other method… Records often name an individual thus; an article in the Banffishire journal of 1859, refers to’Charlie Gordon the Stob-thatcher’. He hailed from Huntly in the county of Aberdeen. The method consists of forcing small amounts of thatch, into an underlying basecoat. These handfuls of material are always bent over at the top. This bent top acts like a spring, stopping the material coming loose. Some wooden fixings are often used to hold the edges of the roof, in a long straw manner; and a separate ridge completes the roof. But no other fixings are required. There are two ways of fixing the coatwork. Both start with a normal eaves, of tied bottles. 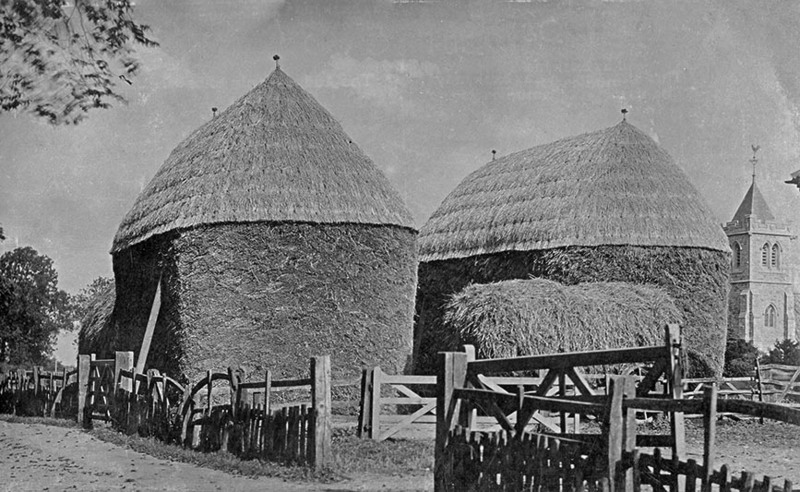 The succeeding coats, then either consist of large handfuls of thatch, that are either tied at the top or applied loose. Both are thrust into the roof in a similar fashion; using a specialised tool… As ever this has many names. Swallowtail, Stinger, Stobstick and the Welsh term, Tobren; all describe the same implement. 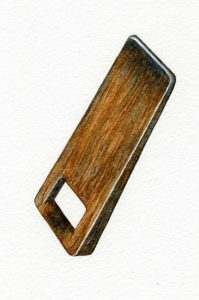 Made of wood or metal bar, around 18 inches (450mm) in length; with a forked end. Stobbing tools… The top wooden affair hails from North Wales. The lower, from eastern Ireland. Where this method is still practiced. Typically the thatcher bends the material over the forked end of the tool and thrusts it into the base. So that around 6 to 8 inches (150 to 200mm) of the thatch remains visible. 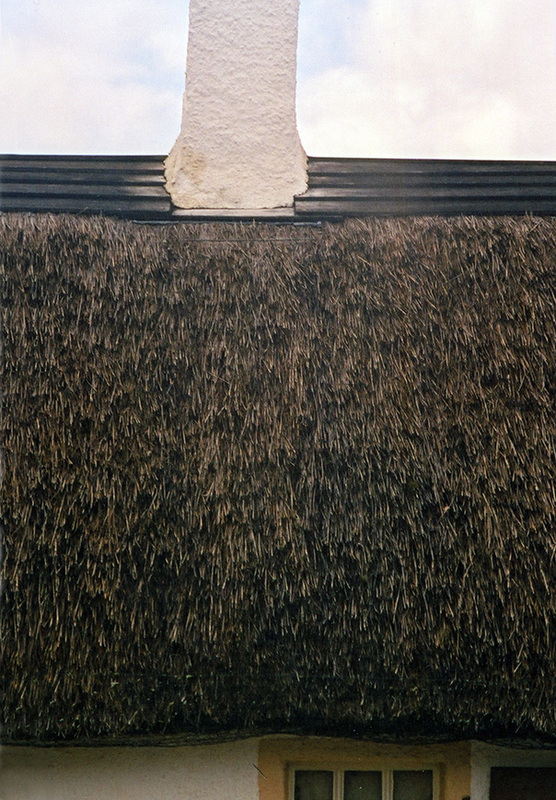 As with standard thatching, the material is put on in layers. These are spaced so that half of the previous layer is covered by its successor. The decline of the trade in the north, saw this type of work disappear, in a few decades. Its slightly unkempt appearance finding few followers, amongst modern thatchowners. 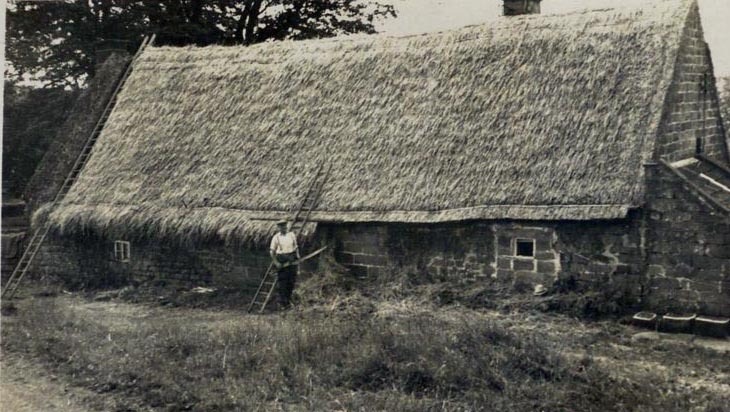 However some recent thatching at Robert Burn’s Cottage in Ayrshire, detailed opposite, has been carried out in this style, keeping the tradition alive.. 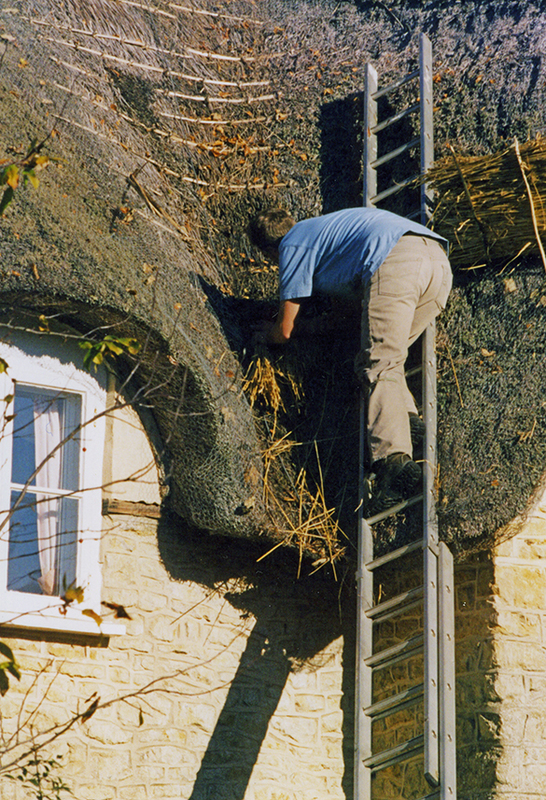 The decline of the stobbing method is rather a pity, as this is a clever thatching method, needing few if any fixings to hold it in place. In the areas where stobbing was popular, a turf ridge often finished the job. This was sometimes bedded in clay or a weak mortar. 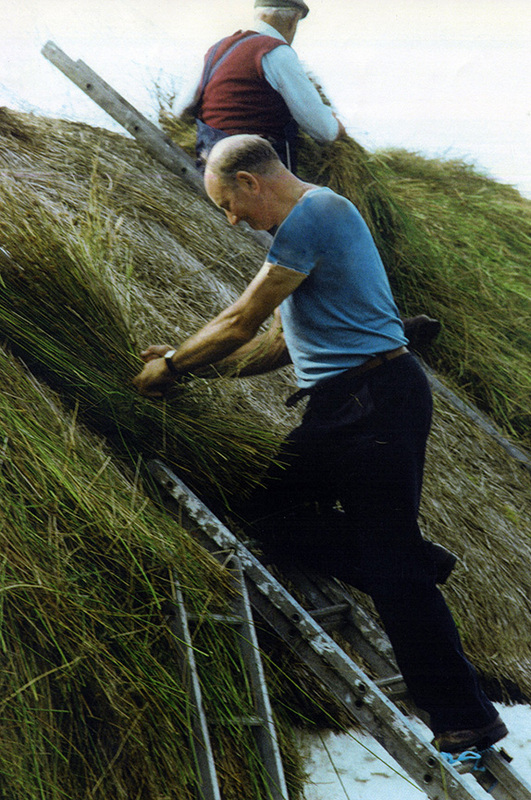 Thatchers in North East Scotland, took the process on a stage further; plastering over the whole roof… Often using lime mortar on the ridge and a mixture of blue clay and cow dung; over many stob thatched roofs. This practice dated from at least the late eighteenth century. It was claimed this method extended the life, of any thatching material, by many years. The rain was said to wash the clay into the thatch, not off. 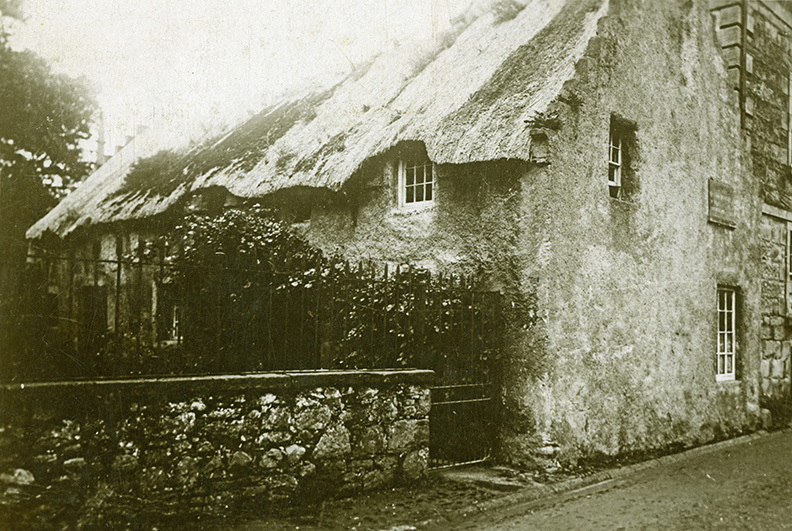 The use of this coating has now died out; along with much of the thatch, in this area of Scotland. 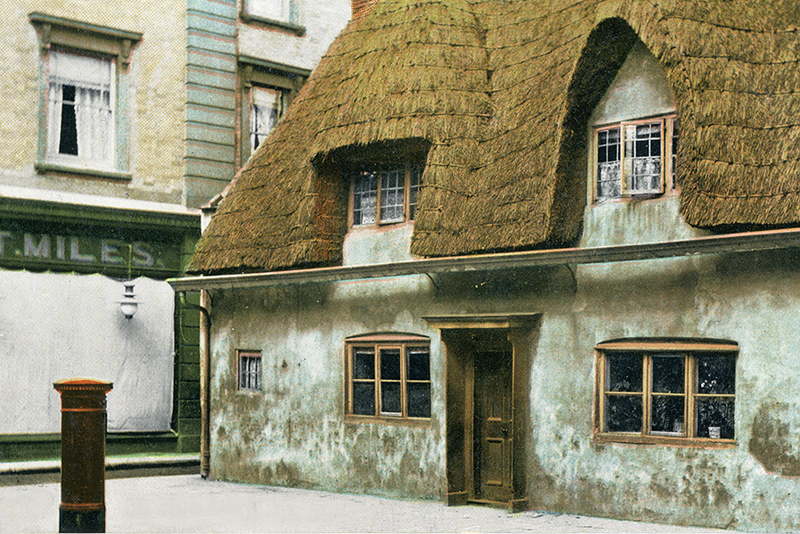 Clay coating… It is difficult to see, on old photos; when a thatch is coated with clay. Often appearing very smooth, many do not seem to be thatched at all. 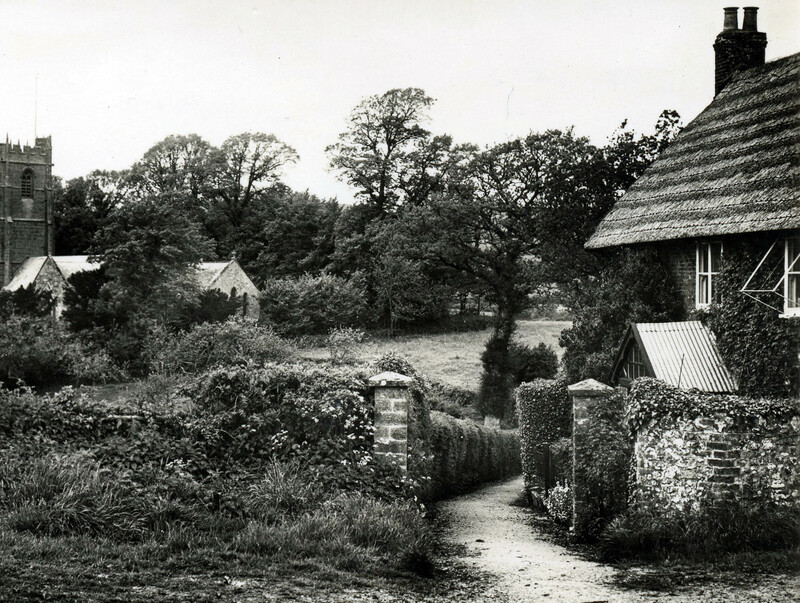 But the one above most certainly is… This is the birthplace of Hugh Miller, a man of many parts; born in Cromarty, in Easter Ross; in what is now the Highland Region. The image shows that areas of the clay have worn; appearing as large white patches. 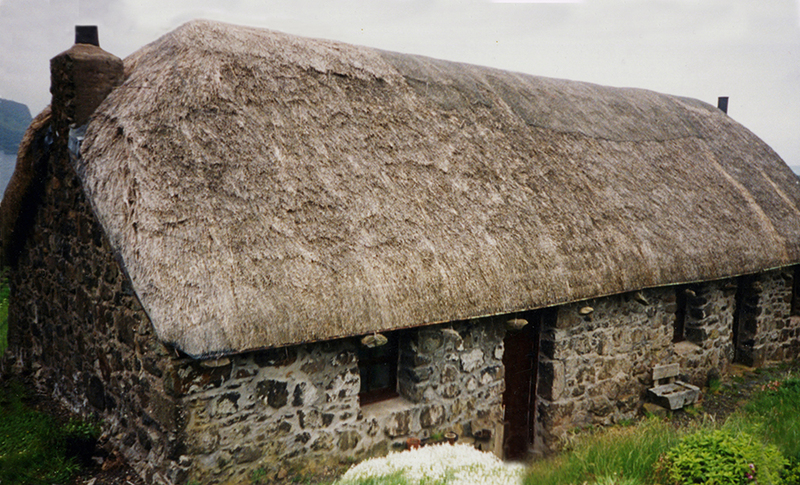 The remains of various clay coated roofs, are still buried under this building’s modern thatch. In the history of the craft; clay, mud and mortar are often mentioned, as a fixing; as well as a ridge; in documents dating from the Middle Ages, right through to the Georgian period. This was spread on each course, down to the line of fixings; the succeeding course bedding down into the wet material. 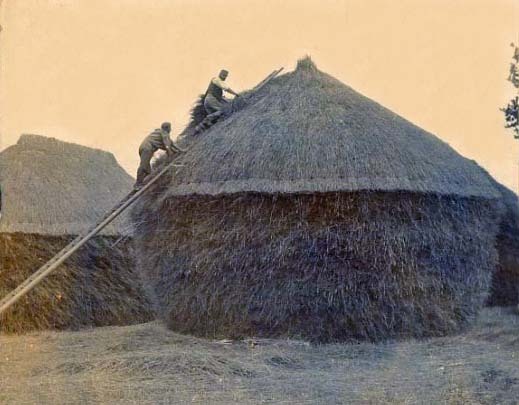 Making a very solid roof indeed… This method lingered on in North East Scotland, until at least the 1930’s. Directional Thatching… A short and useful life. This is a term, often used to describe a very useful working method; which appears under three guises. Firstly, it provides a very quick covering, in the Highlands and many of the islands of Britain; where fine windless days are at a premium. 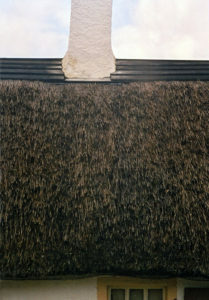 Secondly, it is used to repair standard thatched roofs. And the method was also once used, to thatch countless ricks and stacks, throughout Britain. This working method is called Directional, as all the thatch is laid in a vertical direction. 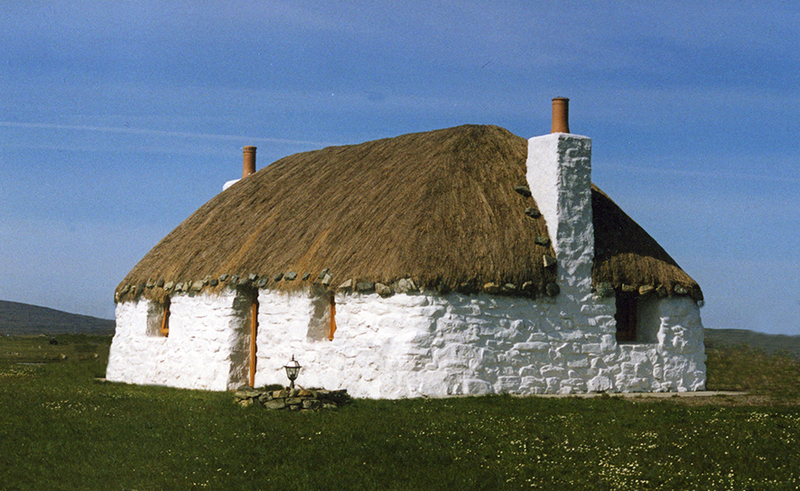 Which distinguishes it from the Random method; a type local to parts of the Hebrides; where the thatch is applied in a random direction… That method is described, when the Hebrides are explored; when Britain’s various thatching traditions are examined. However the directional method is utilised, it always follows some basic rules. 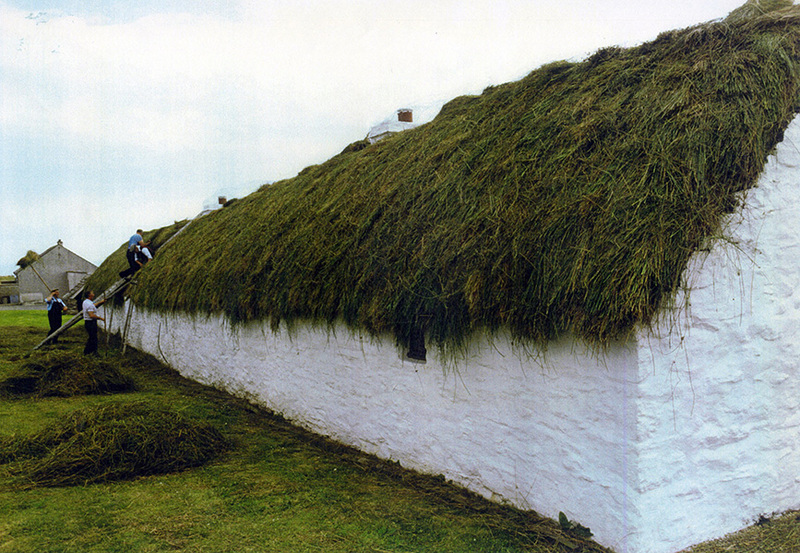 The thatch is put on in layers, which overlap each other by around half their length. These layers should never be less than 4 inches (100mm) in thickness. The layers need to be tightly fixed down; as this method relies on the rain running off the top surface of the coatwork. Outside fixings are used to achieve this… There is generally no separate ridge, the work running seamlessly to the top of the thatch. All the wide variety of thatching materials can be and are used; with the exception of water reed, which is too hard and brittle. The huge advantage this method has, over the standard one; is speed. Roofs can be covered in days, instead of weeks or months. The price paid, is that it’s lifespan is a few years, instead of decades… So where a dry covering is needed, for a short time; this method is ideal. And is why it was used so widely, in covering the hay and cereal harvests. The farmer’s thatched ricks, only needed to last a year or so at most. 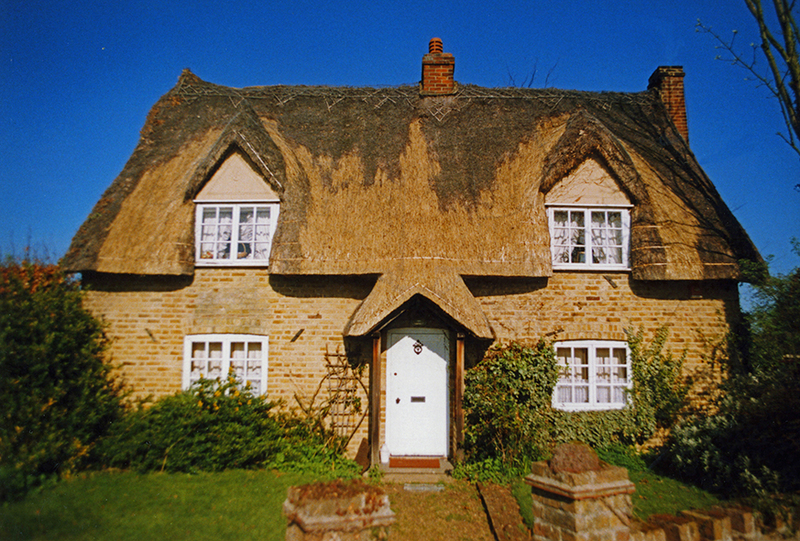 But on a home or barn, the longer the roof survives the better… However large areas of Britain traditionally use directional thatching, as the preferred type of coating… Here it’s the method’s speed that is important and less material is needed to carry out the work. Both of these were once vital considerations; in much of Highland Scotland and the western fringes of Britain; from Shetland to Scilly… All areas with poor soil and one of the most demanding climates in Europe. Local conditions have given rise to some variation. But the basic method, used in this large area, is much the same… Turf is invariably used as a base. As seen in the Materials section, this is often put on the timbers in the manner of shingles. Acting as an organic roofing felt. Over this are placed the layers of thatch… Depending on location, the final coatwork can be as much as a foot (300mm) thick. Oat and barley straw, along with rushes and marram grass, are the most commonly used materials. There is a great variety of fixings employed, depending on locality… Wood of all types, was traditionally too valuable to use, in most of this region. As described, in the Materials section; ropes of straw and heather held much thatch in place. Wire netting is now mostly employed. Both crook and cabers, and spars and liggers are also used; where a little vegetation provides a source of wood. Speed is everything… Thatching here became a communal activity, to take advantage of the few fine days, the variable climate allowed. 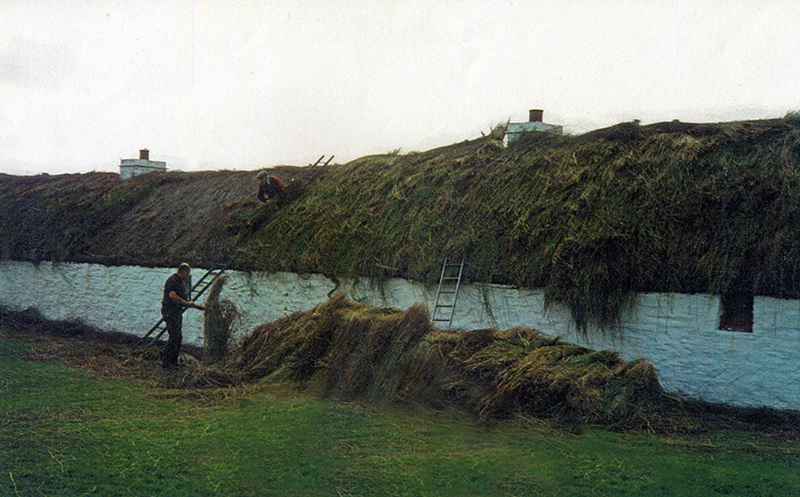 With help from the neighbours, a cottage roof can be thatched and roped down, in a few days at most… Only a few years would pass before it needed a rethatch. But little time would be needed to complete another coating… Professional thatchers were a rarity in this area until quite recently. Coating Laidhay Croft, in Caithness… With directionally laid rushes. Repeat this process many many times… With two pitchers and two thatchers, the result is a thatched and wired roof, in less than a working week… A time scale, thatchers using the standard method, can only dream of! Photos; courtesy Elizabeth Cameron, Laidhay Croft Museum. Finished… Directional coatwork; on the Hebrides. 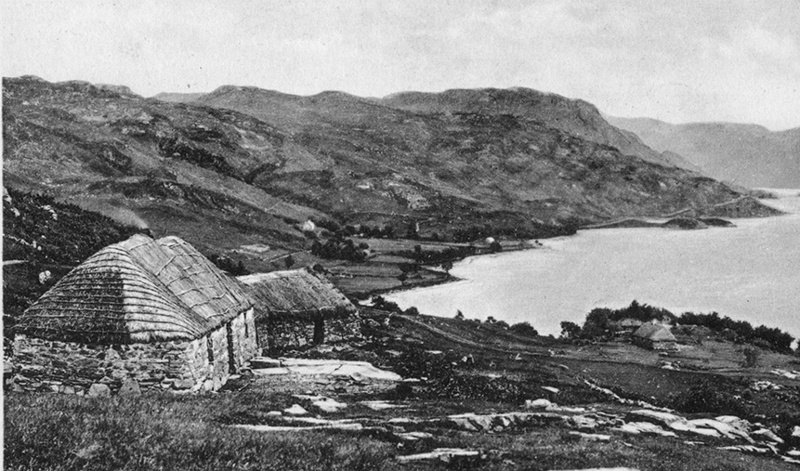 The bottom left thatch on the Isle of Skye, consists of a thick covering of cereal straw. The bottom right roof on North Uist, is thinner and of marram grass. Each area having it’s own tradition, as to thickness and material. 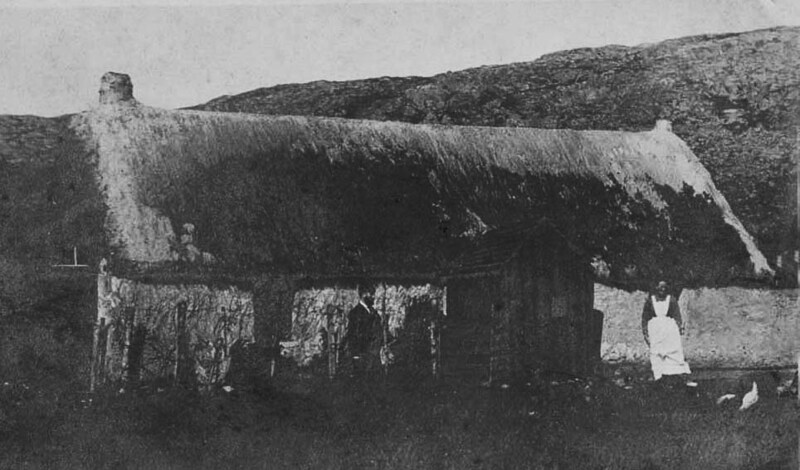 Directional thatch, has long been used here, along with the random method. Left photo; courtesy late Sid Sadler. Repairing the ravages of time… On standard thatch. In the past, it was a case of repairing; and then repairing the repairs; before replacing the coatwork… In practice, directional repairs can go on for decades; covering the same area time and again… Today some owners dislike living in a property covered with patches. And would forego those last repairable years of life, in their thatch. However minds are often concentrated, when faced with a choice. 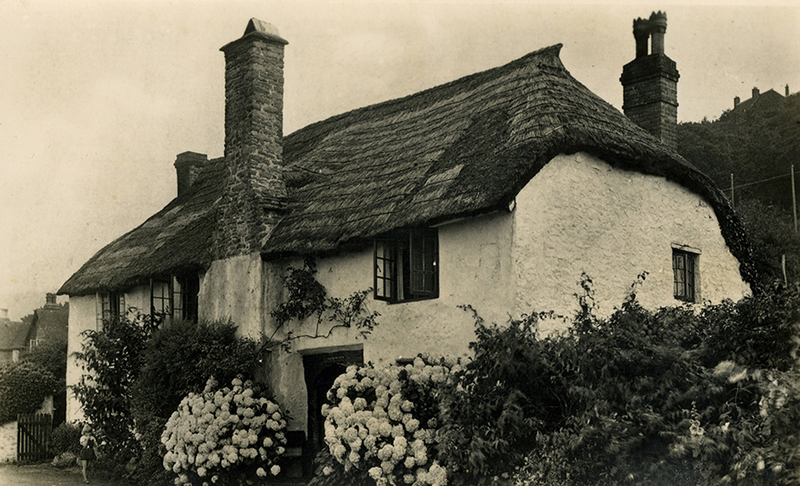 A few hundred pounds for repairing their roof; or several thousand for rethatching it. Patching… No so common, as when these photos were taken. 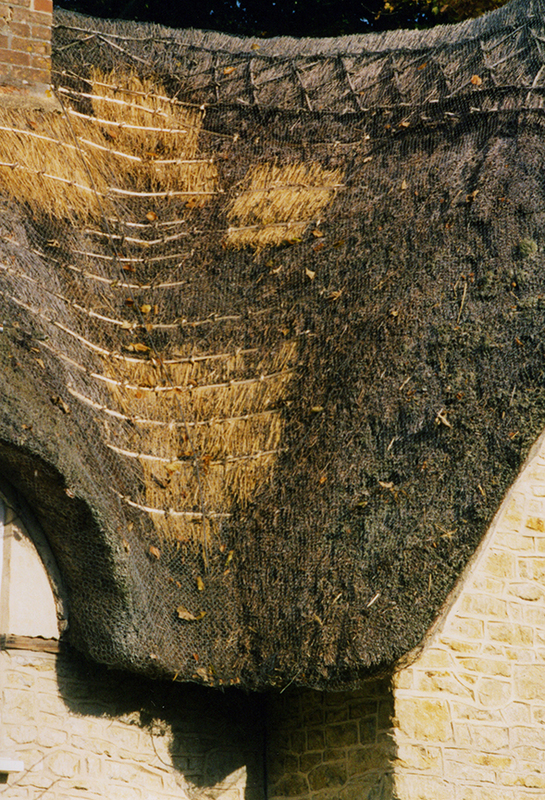 The top, from Poole in Dorset, shows the ultimate repair; over the entire roof… The lower thatch, from Porlock in Somerset, is approaching that state… Anything, to postpone an expensive rethatch. The basic method of repairing, owes a little to the stobbing method. In that the thatcher lifts up the existing coatwork and fits in a layer of material, some way back inside the roof. Another layer is then fixed above the first, so that it overlaps the lower layer by half. This is continued, until the weak area is covered. The final top layer should fit well up inside some reasonable coatwork, so that rainwater does not penetrate behind the repair. Helping hand… In the days when repairwork was much more common, a tool known as a Slice, was often used; to push into and lift up the old coatwork. The one illustrated follows just one of many designs. If large, the repair is done in strips, similar to standard coating. These are then sparred down with liggers, around every 12/18 inches (300/450mm) over the repair… A tidy effect is created, by horizontal liggers being evenly spaced over the work. The spars, being exposed to the elements, should be driven in very much uphill. It is also good working practice to shape the repair, so that it does not have any long straight sides; which may channel rainwater between old and new work. When sparred down tight, the repair should be at least 4 inches (100mm) thick. If combed wheat reed is used in repairing, it is generally used with the butts upwards, in contrast to the standard method… This gives a smoother finish. Repairing a standard thatch… The most vulnerable spot on the roof; under a chimney atop a valley; has already had some attention, in the past… Judgement is now needed, to determine just how much more repairwork is required this time around. The completed repair should lay well with the rest of the roof… Parallel liggers helping to make the work tidy. When the new thatch has toned down, the work will seem less noticeable. This thatch, at Matching Green in Essex really shouldn’t be here; as it has been skilfully repaired using long straw, with the standard method… But the thatcher would still have had to finish the new sections as a repair, as they slid up under the old coatwork. 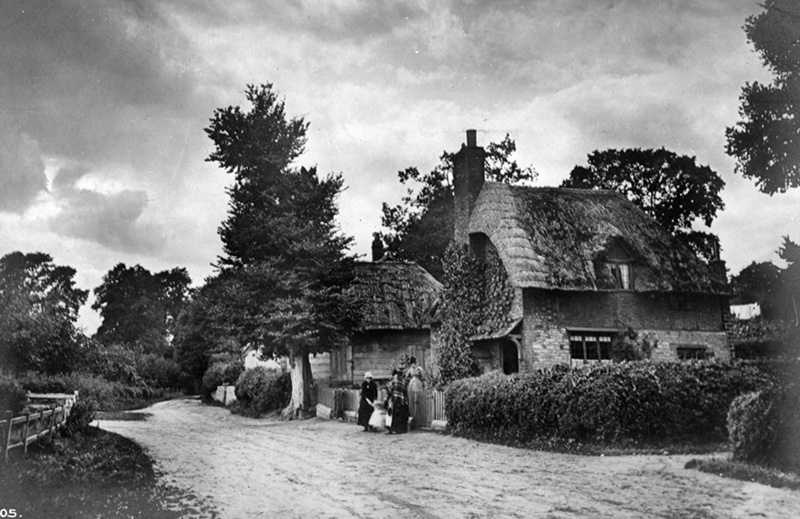 This cottage, at Long Compton in Warwickshire; has a very regular finish, to the repairs on the lower extension… This roof was covered using pre stitched layers of thatch. Created on an old device, like a giant sewing machine; devised for the easy thatching of ricks. One or two modern thatchers still make use of them; to create some tidy repairwork.